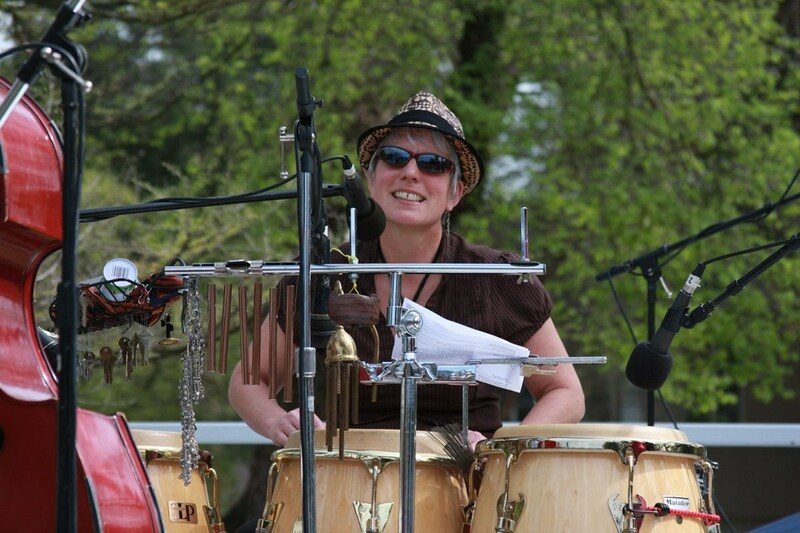 Yolo Mambo brings spicy Salsa, Latin, and World rhythms to any party or occasion! 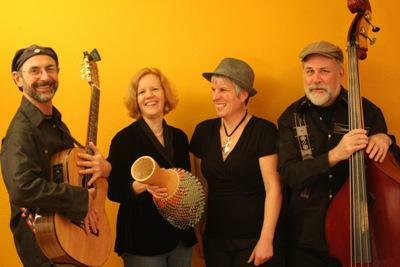 Vocalist Catherine LeBlanc sings in 5 languages: Spanish, Portuguese, French, Gaelic and English, backed up vocally by the entire quartet: Phil Summers on nylon-string guitar, Carla Campbell on percussion, and Steve O'Neill on upright bass. Catherine's original songs have received great reviews in National World music publications such as: The Beat, and Dirty Linen. Our music can be mellow (Jazz Standards) for dinner or cocktails, and lively for dancing. Both Summers and LeBlanc are familiar members of the world music group !Akimbö, while Campbell will be recognized from her work with the Diane Patterson Xtet. O'Neill's career has included touring the US with California Zephyr and, with Campbell, in local Latin group Mejor Que Nada. You will hear original world music and songs from Norah Jones, Stevie Wonder, Eva Cassidy, Sting, Cesaria Evora, Marta Gomez, Susanna Baca, and the Buena Vista Social Club. All are seasoned musicians with over 60 years performing experience between them. "I hired Yolo Mambo to play at a dear friends birthday party in my back yard. I could not have picked a better group to play for our event. WOW!!! Everyone (over 100 people young, old and all in between) LOVED the music. I received many compliments and want to extend them to Yolo Mambo!!!! Your music is fabulous! You made my guests very happy and for that I THANK YOU!!! I am so very happy I found you and look forward to seeing and hearing you all again very soon. Each and everyone of you are so very nice and I felt as though we had known each other for years yet we only met that day! Very easy to work with! No stress, no mess. LOVE IT!!!!" "Yolo Mambo was so much more than I could have hoped for! All four musicians were extremely talented, professional and together created the most delightful musical performance. We especially enjoyed the beautiful voice of the vocalist singing in the various languages. They set just the right tone for our party! One of the things that is so engaging about Yolo Mambo is that they really seem to enjoy working together and therefore exude a happy energy and enthusiasm. My guests were enthralled with the music and I could not have been more delighted. I highly recommend Yolo Mambo for your next party or event!!!!" "The theme of our wedding rehearsal picnic was french. Yolo Mambo made a point of including french songs as well as a wonderful eclectic playlist that was a perfect backdrop for the relaxed picnic atmosphere. They were both professional and personal in their approach to the day's planning. I really appreciate their willingness to work in an outdoor environment with no available electricity! They made the day exquisite!" professionalism? ? ? ? ? ? overall talent? ? ? ? ? ? handling special requests for your event? ? ? ? ? ? how strongly would you recommend Yolo Mambo to a friend? ? ? ? ? ? overall satisfaction with Yolo Mambo? ? ? ? ? ? They performed inside our library and did a wonderful job. They were early and set up quickly - and packed up fast too, which matters since we have to close the building at a specific time. But best of all they gave a terrfic concert. They are at ease with an audience, which had a lot of fun. Plus they are just four extra-talented musicians. Catherine LeBlanc has an amazing voice. We really appreciate their coming all this way. We'd definately book them again. Yolo Mambo was so much more than I could have hoped for! All four musicians were extremely talented, professional and together created the most delightful musical performance. We especially enjoyed the beautiful voice of the vocalist singing in the various languages. They set just the right tone for our party! One of the things that is so engaging about Yolo Mambo is that they really seem to enjoy working together and therefore exude a happy energy and enthusiasm. My guests were enthralled with the music and I could not have been more delighted. I highly recommend Yolo Mambo for your next party or event!!!! Please note Yolo Mambo will also travel to El Macero, Dixon, Sacramento, West Sacramento, Woodland, Broderick, Clarksburg, Winters, Yolo, Hood, Madison, Elmira, Represa, Rio Linda, Elk Grove, Vacaville, Courtland, Elverta, Esparto, East Nicolaus, Knights Landing, Zamora, Nicolaus, North Highlands, Antelope, Carmichael, Pleasant Grove, Robbins, Walnut Grove, Capay.